Earlier this summer I was lucky enough to visit a winery in California with a pedigree unparalleled anywhere in the U.S. After driving up a long and winding road high in the Vaca Mountains on the east side of the Napa Valley, I found myself exploring vineyards with Tim Mondavi. In 2005, the year after the family's eponymous winery was purchased by Constellation Brands for over $1.3 billion, Tim, father Robert and sister Marcia launched their next wine endeavor. After making dozens of different wines for Robert Mondavi Winery for over three decades, Tim and his family decided to make just one wine that would be recognized amongst the best in the world. In honor of his family's winemaking past and looking forward to its future, Continuum was born. The first two vintages of Continuum were sourced mostly from the To-Kalon Vineyard that the family used to own. In 2007, after Tim found out that those grapes would not be available to him in the future he searched for a new source of grapes and a permanent home for Continuum. With the funds to start a winery anywhere in the world, Tim looked to the hillsides of Napa Valley. He was interested in the uniqueness of mountain fruit and had a fondness for Dalla Valle's Maya. Tim looked at property in the Atlas Peak AVA, but found that the fruit was sometimes vegetal due to the cool climate. 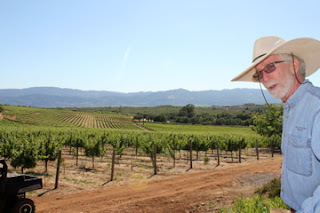 A little bit closer to the Dalla Valle estate, just above its Oakville vineyards, Tim found two vineyards, Cloud View and Versant, in an area known as Pritchard Hill that he found promising. In 2008, 42 years to the day after his father broke ground on his winery, Tim had completed the purchase of both Pritchard Hill properties. With very similar soils to Dalla Valle's just below the ridge, and with neighbors like Chappellet, Colgin, and Ovid on Pritchard Hill, Tim was ecstatic with his find. The Continuum Estate is a total of 173 acres with 62 dedicated to vines at elevations ranging from 1300-1600 ft. Currently, only 41 acres that were planted by the previous owners in 1991 and 1996 are producing fruit. Additional vineyards were planted in 2009. One notable characteristic that differentiates Continuum's vineyards from their Oakville neighbors below is the sizable acreage of cabernet franc. Tim told me that he found that the Robert Mondavi Cabernet Sauvignon Reserve wines evolved much better with age when they contained higher proportions of cabernet franc. Cabernet sauvignon is still the workhorse at Continuum with 55% of the estate vineyards devoted to the variety and 30% cabernet franc, 11% petit verdot and only 4% merlot rounding out the remainder of the vineyards. The extremely shallow and rocky volcanic red soils also cause the vines to be extremely low yielding. Continuum averages less than 2 tons of fruit per acre whereas more than 6 tons per acre is not uncommon in the fertile valley below. Being a bit boastful, it was while we were standing next to a block of cabernet franc that I told Tim that Colorado vintners also produced some worthy cabernet franc. This piqued Tim's interest and he jokingly suggested that there be a Colorado vs. California cabernet franc tasting. Ever the supporter of the local winemakers, I agreed to take Tim up on the offer. I'm still trying to plan this tasting. In the meantime, I sent him a few of my favorite Colorado wines to prove their worth. I will eagerly report back on Tim's verdict on Colorado wine! With the transition to an estate wine initiated, the 2007 vintage of Continuum included 20% of Pritchard Hill fruit from the vineyards that would become his, with the rest coming from the To-Kalon Vineyard in Oakville. Each vintage since has seen seen an increase in Pritchard Hill fruit, with the yet-released 2010 boasting 92% estate-grown fruit. I was lucky enough to taste the 2007, 2008 and 2009 side by side with Tim and Burke Owens of Continuum. The wines were impressive, but the standout to me might actually have been the 2010 estate olive oil. Made from six different types of olives grown on the property, this golden elixir was floral, fruity and even a bit spicy. As you may have noticed, the title of this post notes a lesson to be learned. Continuum is one of only a few wineries amongst tens of thousands that produce just a single wine. No second wine. No family or lineup of equals. Just one wine. Any juice that Tim and company feel is not worthy of being included in the final blend is sold off as bulk wine. I'm guessing that this 'rejected' wine is actually pretty darn good in its own right and many winemakers or winery owners would like to utilize this resource rather than just selling it off as bulk wine. Tim's decision deserves the utmost respect. Too many wineries, including many here in Colorado, try to make too many wines. Now, I'm not advocating that all wineries only produce one wine, but that wineries don't overextend themselves by trying to make a wine for every consumer. In fact, this very problem is perhaps what caused many of the well documented problems at Robert Mondavi Winery before it was sold. Tim was not comfortable with the business model of making too many wines and believes that is what led to the eventual sale. There are plenty of wines that Colorado wineries make that I think they shouldn't. Not because they are bad wines, but that by making 10, 15 or even 20 wines wineries are perhaps limiting the potential of the 4 or 5 they do, or could do, best. Some wineries make awesome reds. Stick with that. Some make delicious whites or fruit wines. Don't make a mediocre red if it means compromising even a little bit on another wine. So, if a Colorado winemaker happens to read this, please consider making fewer, but better, wines. I know Tim Mondavi would approve of that advice. "Light of the Vine" is a shadow painting of a cabernet franc vine by Chiara Mondavi; the wine's label. Kyle, I agree that a Winery should make a few great wines and not over extend themselves into a lot of mediocre wines.